Producing Custom Engraved Dog Tags and Personalized Dog Collars is Our Specialty. Producing high quality custom dog tags, personalized dog collars and dog collar name plates is our main focus and specialty at dogIDs. We have been engraving dog ID tags since 1999 for thousands of customers worldwide and also for other retailers, veterinarians, animal shelters, government agencies and various dog organizations. Keeping a dog identification tag with up to date contact information on your dog's collar at all times is the most dependable and cost effective way to ensure you and your canine companion are reunited quickly if ever lost! Since dog collar ID tags are a necessity for all dogs why not make sure your dog has a great looking name tag or nameplate of the highest quality from DogIDs.com? Top Quality Custom Engraved Dog ID Tags and Personalized Collars. We only use top quality engraving materials and cutting edge laser engraving equipment to ensure our dog ID tags and nameplates are produced in a uniform manner with top-notch appearance and life-long readability. Since we only use solid brass, stainless steel, gold plated brass and nickel plated brass materials, you can be assured that your custom laser engraved dog ID tags or nameplate collars will last for years without peeling, fading, discoloring or causing skin irritations like some other plated metals can. We use the latest fiber laser technology to engrave our tags. Many pet tag manufacturers use lower power CO2 laser engravers that do not actually engrave the metal but rather mark or laser bond on the metal. This type of laser marking does leave a clean dark mark but will eventually be illegible as the metal from the tag wears down. 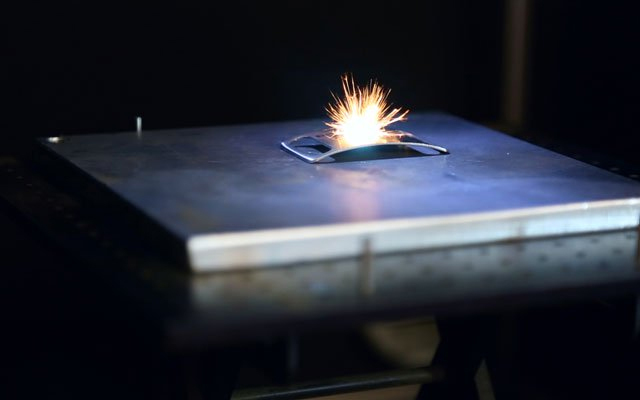 We at dogIDs use a high power fiber laser to engrave our tags which actually vaporizes and removes the metal so it is actually engraving instead of marking or laser bonding. This allows us to engrave deeply into the metal with pristine detail in a nice contrasting engrave color that will never wear off. We guarantee it. We can engrave any character that can be typed on a standard keyboard so feel free to be creative! We can engrave from 1 to 5 lines of characters on all of our dog ID hang tags and dog collar nameplates. Just keep in mind that the more lines and characters you want us to engrave, the smaller the text. All characters are centered horizontally and vertically unless you specify otherwise on your order. Arial is the default font we use to engrave our dog ID tags but we also offer many other different engraving fonts for you to choose from if you would like to! Arial: dogIDs - 800-720-824. The quick brown fox jumps over the lazy dog. Arial Round: dogIDs - 800-720-824. The quick brown fox jumps over the lazy dog. Bodoni: dogIDs - 800-720-824. The quick brown fox jumps over the lazy dog. Bradley Hand: dogIDs - 800-720-824. The quick brown fox jumps over the lazy dog. Century Schoolbook: dogIDs - 800-720-824. The quick brown fox jumps over the lazy dog. Garamond:dogIDs - 800-720-824. The quick brown fox jumps over the lazy dog. Informal Roman:dogIDs - 800-720-824. The quick brown fox jumps over the lazy dog. Kristen:dogIDs - 800-720-824. The quick brown fox jumps over the lazy dog. Lucida Handwriting:dogIDs - 800-720-824. The quick brown fox jumps over the lazy dog. MistraldogIDs - 800-720-824. The quick brown fox jumps over the lazy dog. Rockwell:dogIDs - 800-720-824. The quick brown fox jumps over the lazy dog. Tempus Sans:dogIDs - 800-720-824. The quick brown fox jumps over the lazy dog. Verdana:dogIDs - 800-720-824. The quick brown fox jumps over the lazy dog. Just For Dog Collars? No! Horse Saddles, Bridles, Harnesses and Halters.